Some venues are provided transit services that are outside of our regularly scheduled service. Check to see if the venue you are visiting could have service to help get you to and from the event you will attend. The Levi's® Stadium, in the city of Santa Clara, is the home of the 5-time Super Bowl champion San Francisco 49ers. VTA is the best way to take you to the action with bus and light rail service dropping you off right at the entrance. Please visit our Levi's® Stadium page to find out how we can easily get you to your event and back. Avaya Stadium is the home of the San Jose Earthquakes. The stadium is the first cloud-enabled stadium in Major League Soccer and is considered one of the most high-tech fan experiences in soccer. 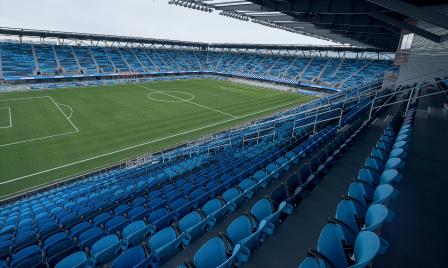 Avaya Stadium is located at 1123 Coleman Avenue across the street from Mineta San Jose International Airport. Customers can access Avaya Stadium for all events and stadium tours using Line 10 service. Please Note: There will be no extra service provided for Avaya Events.​ Line 10 will operate on regular schedule. Line 231 is no longer in service. The SAP Center, known locally as the Shark Tank, has been the home to San Jose Sharks since the 1993-1994 season! Located in the heart of downtown San Jose, SAP Center frequently comes alive with many events, concerts and shows. Aside from being well-served by VTA bus and light rail, SAP Center is also served by Caltrain, and the Highway 17 bus. Whether you are going to catch a Sharks game, attend a concert, or hobnob with the greatest wrestlers of all times, let VTA get you there. Let us deal with the traffic so you can focus on having a good time. From Cinequest and Cinco de Mayo, to the 4th of July fireworks at Discovery Meadows and the San Jose Rock and Roll 1/2 Marathon, Silicon Valley plays host to a wide variety of special events each year. As always, VTA is your number one commute option. Special Event pages have all the information you will need to get to your favorite event. Our strong partnerships with these organizations help to provide you with great information and the best experience Santa Clara County has to offer. Some venue times and locations may be outside our regularly scheduled service, so please use our trip planner to check if the location you are visiting is served by VTA.